This is another post on the subject of infrastructure failure. This will deal with the sewer systems. If you are on a septic tank, you will probably not have problems. However, people who live in more urban areas can have a nasty problem. Depending on where you live, you may have a risk of other people’s sewage backing up into your home. For instance, I am aware of low-lying areas in which the sewage has to be pumped up hill to get to the treatment plant. If you live in a low-lying area that is dependent on pumps and the people above you continue to use their system after the power has failed you should have a plan to plug your sewer line. From my own study of the sewer system, this is more prevalent in some communities than one might suspect. The more hills you have in your area the more likely this is to occur. If you live in large apartment buildings especially high rises, you may have a similar problem. This could be bad enough to force you to leave. If you live in an area where this could affect you, learn about how you would be impacted. Something as simple as a bag of Ready Crete cement could save you a giant mess. Knowledge can be power. This entry was posted in medical, safety, Shelter and tagged Howard, Infrastructure Failure, sewer. Bookmark the permalink. For about $3 you can purchase a 4″ sewer end cap. In event of sewer back-up, cut and install the cap. In place of glue, wedge a rock in place to hold it on. After the crisis is over, a 4″ rubber collar can be used to repair the cut. Unfortunately in my case the way the sewer lines comes in underground it would be easier and quicker to dump a bag of Ready Crete down a clean out. If your lines are easily accessible your way is much better. 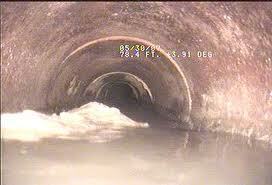 SEWAGE: Fifty percent of our current water usage is for removing sewage. What is recommended is to invest $25 to build a stand alone inside toilet and on a weekly basis add its contents to a compost pile. This pile will never be needed to be turned or worked in its two year life. It can later be safely used as compost for the garden above, supplying all of the nitrogen needed by the plants. There is no smell, flies or danger of pathogens from this method. This method reduces the water needed for sewage from 1,500 gallons per month to 2 gallons per month, and in the process will feed you. I had an experiance close to this during hurricane wilma in south Florida. The power was out for days and so the pumps did not pump the sewer water out. I do not understand why they did not have emergency generators for this but thats another story. Luckly the water was also off so there were not many people flushing or using the drainage system. We got water from the neighbors pool to flush our toilets and got 2 or 3 flushes before they would not flush anymore due to full sewer system. Luckly not many were using the system or I am sure it would have started backing up into the houses. I don’t know if I would attemp to cut the system after such an incedent. Trying to stop the back flow would be a mess. I guess if you knew it was going to happen or did it directly after the disaster you might be ok but if I was to return to a low laying area I think I would put in a permenent gate valve or something. The gate valve installed now is the real answer. However, ignoring the problem means either your home or someone else’s home may become uninhabitable if near a failed lift station. The real concern is that you can fix your own home and think that all is OK, but then catch cholera and typhoid fever from your neighbors’ actions. That is why I am sold on the composting toilets. They can be built out of materials on hand in every home. Teach all of your neighbors this method and avoid the dreaded diseases! 1. Resolve the sewage issue. 2. Reduce water demand by 50%. 3. Greatly reduce the disease issue. 4. Feed yourself (the compost pile).